This house is down a private long drive away from the noise and chaos of the city but still within a close distance to many attractions and businesses. Enjoy your day in the peace of a working hobby farm complete with cattle, horses, alpaca, sheep, pigs, and many different poultry. Currently we have three bottle fed calves. Be sure to ask us about helping with the feedings. Your stay will be a chance to unwind and just enjoy the quiet. You may even want to venture down to the stocked pond and enjoy some fishing. You can also take a short walk to the neighboring pick your own berry farm during the summer and fall. Please let us know if you need any extras- play and pack, high chair, exersaucer, etc. We can probably provide any extras you may need especially if you are traveling with a little one or two. The house has a queen bed in the master bedroom and and three twins in the second bedroom, including a bunk bed. If needed there are also two additional single roll away beds. The house can accommodate a family of seven. As noted in the listing our guest house does not have a TV, internet, or wireless. The house is a place "Get Away From it All". It's the perfect place for quiet and peace, a nice break from the noise we are all surrounded by every day. Absolutely no smoking anywhere on the property and no pets allowed. No visitors or parties allowed. If you need to reach us please call or text. Please do not come over to our private residence. We respect your privacy at the guest house and ask that you respect our privacy at the farm house. There will be no additional guests added to a reservation on the day of the reservation or any day after the first day of the reservation. If you need to add a guest please contact us before the date of your reservation to request additional guests be added. We will consider requests that are submitted before the date of the stay. Enjoy your own quiet retreat. Your home away from home awaits down the 1/3 mile private lane to a working farm with horses, cattle, and other livestock. Bring your tackle for fishing in the pond! We had a wonderful, peaceful stay! The house was very comfortable and the farm was beautiful! Our family stayed here while in Xenia for our niece's wedding. It was roomy, clean and well stocked. Our grandchildren especially enjoyed all of the toys that were available, the lightning bugs, and the farm life nearby. Lots of sleeping options so we were very comfortable. 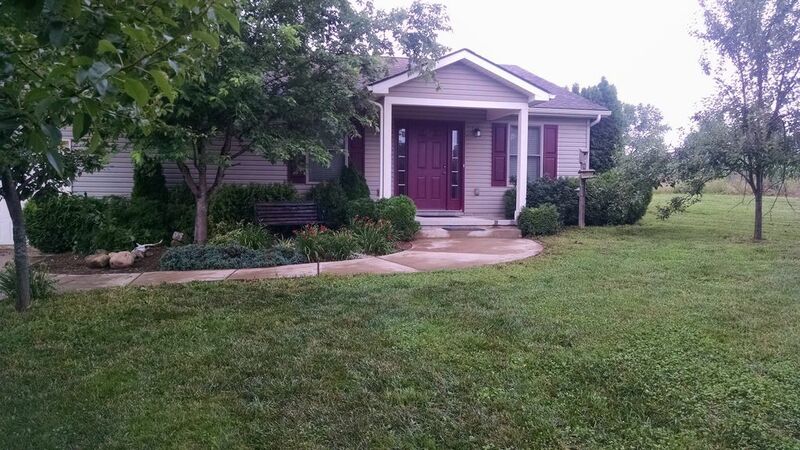 We will certainly consider this property for any future family trips to Xenia (three more nieces) and would recommend it for any family with small children. Because of all the rain and our busyness, we did not meet the owners, but they made our stay very enjoyable. Next time we would bring paper towels, a box of Kleenex and children’s dinnerware. We really liked the location. The family were great no problems. We would definitely stay there next time we have the occasion to be in that area. Andy, Ellen with their son Andrew daughter in law Casey and their grand baby Molly. It was quite, clean and had lots of things provided. Our family enjoyed our stay, we played games inside as well as in the front yard. Will stay again if we are in the area. The home was clean and beautiful...the location was gorgeous. I wish that we could have stayed longer to enjoy everything. Hope to return in the future. Very peaceful and lovely spot. We enjoyed our 2 night stay in Xenia. Nice nature around. Clean and bright little home . We felt very welcome.